Hi Hi! Ok so if you’re like me you are such a sucker for banana bread. Well I have a weak spot for anything with banana in it! So I tend to be sad when my bananas go bruised and brown. So of course banana bread is always a solution! But this recipe is not a NORMAL banana bread! 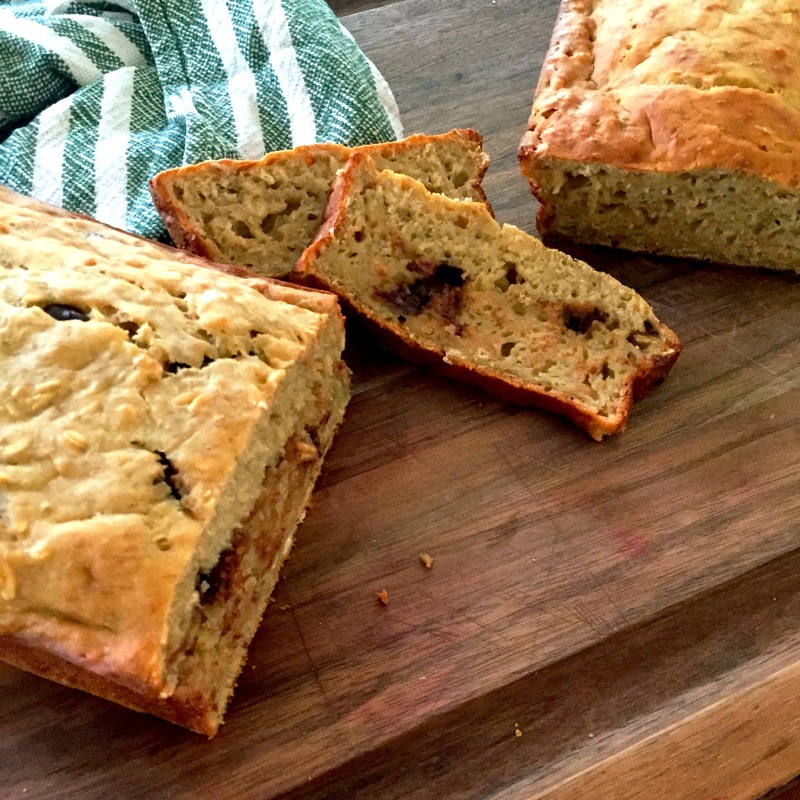 This is the best and most moist banana bread you will ever have! Here is the secret! Greek Yogurt! Yes you heard it! 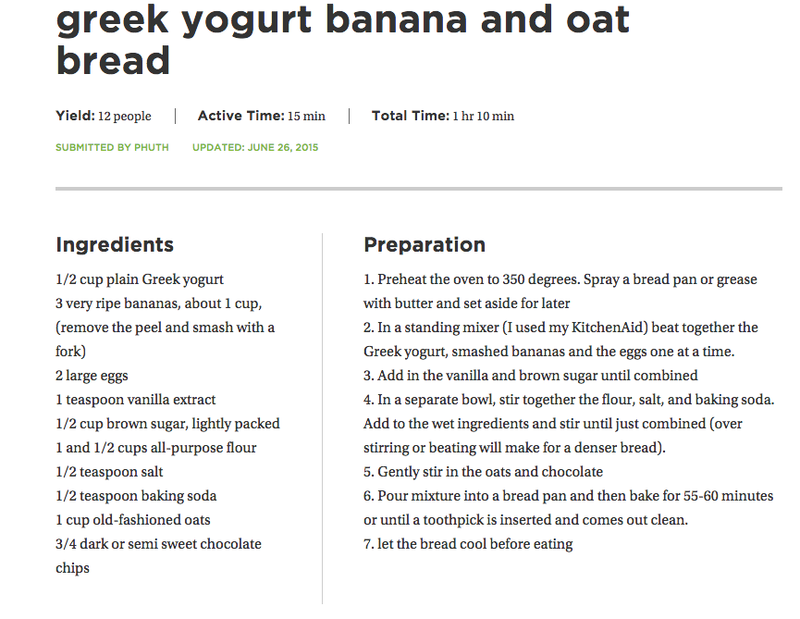 Greek yogurt is a great substitute for butter and oil making this recipe a bit healthier! Also as I chose to double this recipe because we had 6 bruised bananas at home and do one with semi-sweet chocolate chips and one without! Feel free to add whatever you like!! I put this recipe to the test with my family and let’s just say it was gone in a day!! This recipe was adapted from Chelsea Messy Apron! 1. Preheat the oven to 350 degrees. Spray a bread pan with PAM or grease with butter and set aside for later. 2. In a standing mixer (I used my KitchenAid) beat together the Greek yogurt, smashed bananas and add the eggs one at a time. 3. Add in the vanilla and brown sugar until combined. 4. In a separate bowl, stir together the flour, salt, and baking soda. Add to the wet ingredients and stir until combined (over stirring or beating will make for a denser bread). 5. Gently stir in the oats and chocolate. 6. Pour mixture into a bread pan and then bake for 55-60 minutes or until a toothpick is inserted and comes out clean. 7. Let the bread cool before eating.